Stephen Kaltenbach and more: UPCOMING SACTO ART! 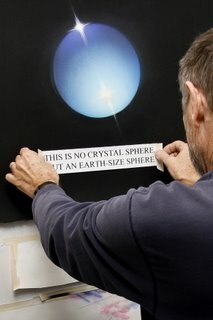 Those of you who have picked up the January issue of MM have probably read our cover story on artist Stephen Kaltenbach. Kaltenbach is a local hero– a pioneer of conceptual art right up there with Bruce Nauman and the rest. On top of that, he created what just may be the best piece of art in Sacramento: Portrait of My Father, which is in the Crocker’s permanent collection. I first heard about Steve and his work from an artist pal named Richard Haley about 6-7 years ago. SK was giving a lecture about his work and Richard assured me that it was not to be missed. He was right. Kaltenbach’s examination of his work was mind boggling.. in the truest sense of the word.. as in, I walked out a different person than when I went in. And I wasn’t the only one. Kaltenbach’s show, Nuclear Projects and Other Works, opens at the Verge Gallery on Thursday January 8, from 6-10PM. The show is also the Grand Opening Party for the Verge. 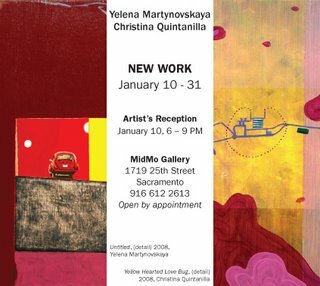 This just may be the single most exciting Sacramento art event to happen in years, and I urge you not to miss it. Artifacts on K Street kicked off their new gallery component in December. Artifacts has been be presenting emerging artists with a contemporary urban flavor, and Amanda Lopez’ January show was absolutely great– the busiest– and liveliest– show we saw the whole night. 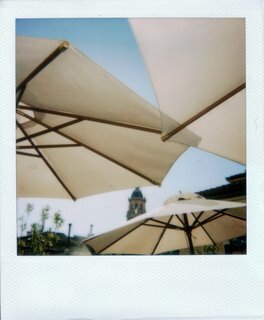 This month they’ve got Polaroids, Coffee and Pigment, an Exhibition of Ideas, by Richard and Corine St. Ofle. The husband and wife team make interesting work, with Corine presenting a beautiful series of polaroids while husband Richard will exhibit abstract paintings made with paint and that ever-present stimulant, coffee. From what we’ve seen, this is going to be good. Artifacts is at 905 K Street and the opening runs from 6-10PM. And, last, I’ll shamelessly pimp the first exhibit at Midtown Monthly‘s brand new gallery space, midmo. New Work is a show of just that– new work from two emerging artists, both art students at CSUS. Yelena Martynovskaya and Christina Quintanilla each paint colorful abstractions which sometimes feature recognizable images buried in the mix. We enjoy their work and hope you will too. Midmo is located at 1719 25th Street (25th and R) and the reception runs from 6-9PM on January 10.